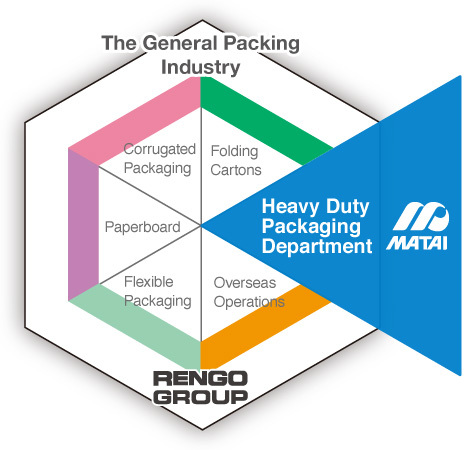 Nihon Matai Co., Ltd. plays an important role in General Packaging Industry policies of Rengo Group, primarily through the production of heavy duty packaging materials. Since our foundation in 1947, we have cultivated our technological capabilities focusing on the development of diversified products and new businesses. What is more, in recent years, we continue to grow under the banner of a technology-oriented company, by promoting advanced R&D and integrating our efforts in research, manufacturing and sales to further improve cost performance and quality performance. In the heavy duty packaging industry, we have consistently held the largest market share domestically, and our products are highly evaluated by our customers in Japan as well as foreign countries. Nihon Matai will continue supplying products that meet customer’s requirements opening up business opportunities and advancing technological innovation in response to changes in society, while taking advantage of the synergies of the Rengo Group’s sales capabilities, purchasing strength and global network. “Matai” of “Nihon Matai” comes from “jute bag (“matai” in Japanese).” Uchida Masunosuke Shoten (the predecessor of Nihon Matai) collected and sold used jute bags. Later on, Masuzo Uchida founded Nihon Matai Co., Ltd. (written in Chinese characters). In 1957 when the company marked its 10th anniversary, the company name was changed to Nihon Matai Co., Ltd. written using katakana, with a view to diversifying and expanding business. 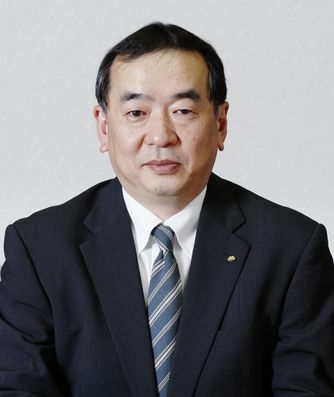 Nihon Matai takes charge of the Rengo Group’s Heavy Duty Packaging Department. With high-level technological capabilities and reliable distribution management, Nihon Matai offers excellent heavy duty packaging products and enhances the value of our customers’ products. We aspire to be a company that instills pr ide and dreams, while contributing to the development of industry and culture of life. Obtain customer satisfaction and earn trust through robust business activities and realize prosperity and dreams. With high ethical standards, thoroughly comply with laws, and always act with integrity. Continually make efforts to communicate with the society, through active and accurate information disclosure. Respect the value of each employee, make an effort to create a safe and pleasant work environment, and realize comfort and affluence. Take the initiative in conserving the global environment. Make a contribution to society as a good corporate citizen. Comply with laws in response to globalization, and make a contribution to the economic and social development, while keeping in mind customs and cultures.